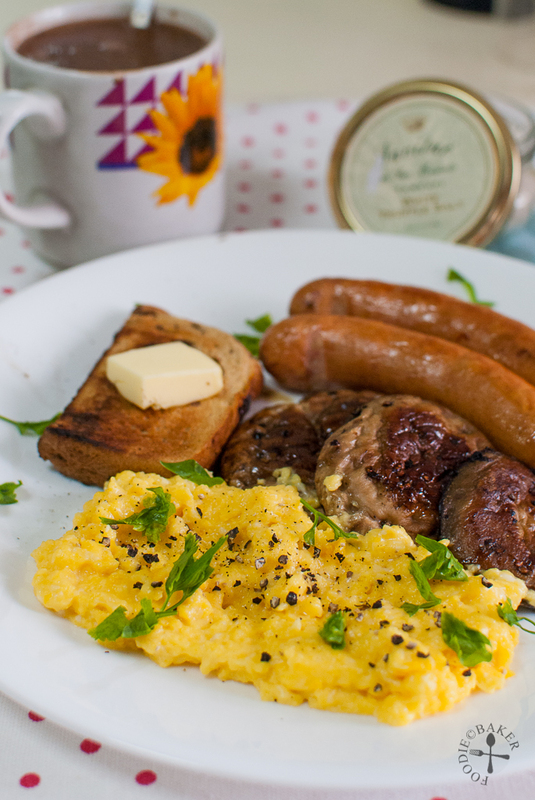 Truffle scrambled eggs, sautéed mini portobello mushrooms, gouda-stuffed sausages, buttered raisin toast and a mug of hot chocolate – a hungry tummy is satisfied! You’d have probably seen this on my Instagram (follow me if you haven’t @foodiebaker!) Scrambled eggs was something that I cook pretty often for brunch in the past but it got quite boring – the sides were always sausages, mushrooms, toast, hash brown etc, so these days, I only cook it when I’m either cooking for 1 or when there’s no time to cook a proper lunch. 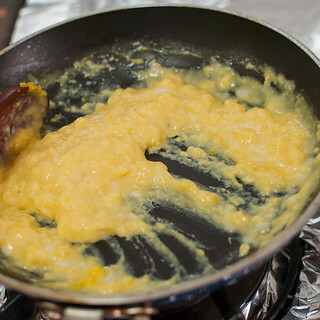 Contrary to what most people think, scrambled eggs are actually very easy to prepare! 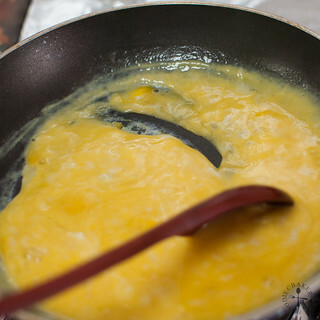 With the proper technique, you will achieve creamy and velvety smooth scrambled eggs in about 2 to 3 minutes (for a 2-egg recipe) and you only need 4 ingredients – eggs, butter, salt and pepper – yes, no cream or milk is used! What requires more time are the sides! Here’s how raw eggs transformed into something delicious in just minutes! 1) Crack 2 eggs and add a knob of butter inside. 2) Mix together over medium-low heat. 5) After 2 minutes... 6) After 2 minutes 30 seconds, done! I’m going to submit this to Little Thumbs Up organised by Doreen from my little favourite DIY and Zoe from Bake for Happy Kids. This month’s theme – Egg – is hosted by Yen from Eat your heart out. The recipes are all linked at this POST! 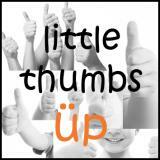 This will also be my last eggy post for Little Thumbs Up, can’t wait for the new theme – pandan – next month! 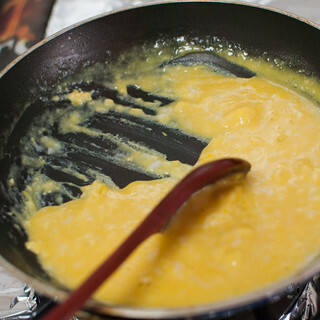 Crack the eggs in a small non-stick pan and add in the butter. Place the pan over medium heat and stir together with a wooden spoon to mix them together. Continue to stir frequently, until curds start to form at the bottom, about 30 seconds. 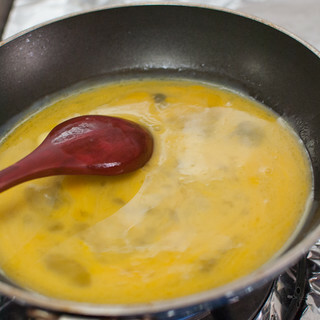 Start stirring the egg mixture every 5 to 10 seconds, scraping the sides and bottom until the eggs reach just below your desired doneness (the eggs will finish cooking with the residual heat). Transfer the eggs onto a serving plate and season with the truffle salt and black pepper. Serve immediately. - I learned this technique of scrambling eggs from Gordon Ramsay and he actually had a video on it. Great way to learn how to cook scrambled eggs! Add the salt only at the end before serving! Salt will breakdown the protein in raw eggs and you will end up with watery scrambled eggs. You can use regular salt if you are not a truffle fan. 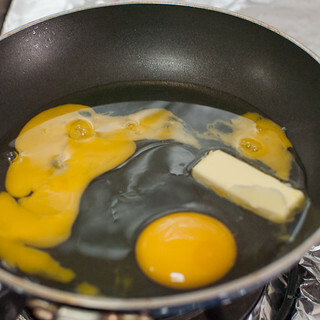 If you find that the eggs are cooking too quickly, turn down the heat or remove the pan from the heat, give the eggs a quick stir before returning the pan to the heat. If you are serving with other breakfast components, make the rest first and the scrambled eggs last. Scrambled eggs taste awful when they are cold. If you are cooking for more people, try to cook only 2 to 3 people’s portion at a time as it will be very hard to cook the eggs evenly. The cooking time will also be longer if you are cooking a larger portion. I learned this technique of scrambling eggs from Gordon Ramsay and he actually had a video on it. Great way to learn how to cook scrambled eggs! Hi Jasline, awesome breakfast like from 5 star hotel. Thanks for sharing this delightful recipe. Wow Jasline, what a gorgeous, refined breakfast! Hi Mary you’re really sweet, thank you very much! Have a great day too! Thank you very much! Have a delicious day ahead! 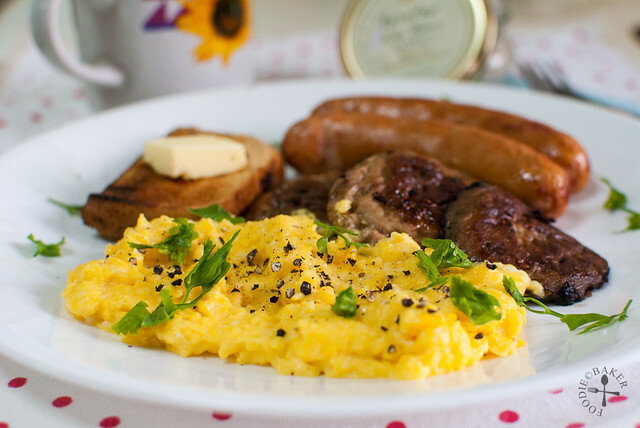 I love scrambled eggs and very often I make this for breakfast too. I guess it taste great with truffle salt. Hi Mel! Scrambled eggs are such comfort food right? Your pictures are truly mouth watering. Felt like grabbing it off the screen…. Hi Mich, thank you so much! I hope your screen doesn’t have a hole now! 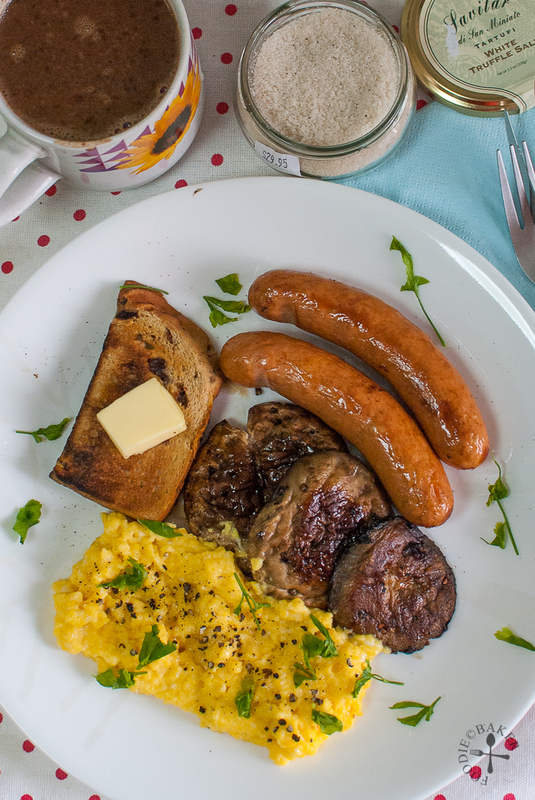 I love fried eggs or eggs of any kind:D Your scrambled egg looks perfect, not charred at all!Those mushrooms and sausages looks delicious too! Hi Zoe! Yes I think it’s a great way to work the palatte up because not everyone’s fond of the taste! Oh, how nice to have this for breakfast once a while, hahaha! So far, I have only seen 1 place selling truffle & truffle oil but thery aren’t cheap, still thinking whether I should at least give the truffle oil a try, hehe. Your scrambled eggs were cooked perfectly! It was my father-in-law who taught me how to cook scrambled eggs. Hi Jessie! I got my truffle oil at SGD 14 for 250 ml and truffle salt at SGD 29.95 for 100g. It’s not cheap but a little goes a long way! Thank you for the compliments! Wow you are so lucky you had someone to teach you! I learned from videos and I don’t know how many rubbery eggs I’ve gotten before I perfect it! haha! 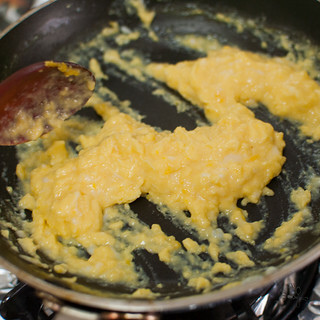 This scrambled eggs look delicious, like the creamy texture…what a great breakfast Jasline. Hi Juliana, thank you so much! Have a delicious week ahead! Wow, that is one mouth-watering plate! I would be happy to have this for my breakfast, lunch and dinner! Hi Joyce! Woah you won’t get sick of it? I will because there’s not enough meat in there hahaah! Thank you for the compliment! What delicious and extravagent eggs! Yum! I have truffle salt just waiting for this lovely recipe! I love scrambled eggs and haven’t made them in eons. The hubby and daughter may be traveling this weekend, so guess what I’ll make for dinner??? What an easy and simple way to kick those scrambled eggs up a notch! Love the idea. 🙂 They look yummy. Hi Tina, thank you! Glad you like it! hi jasline, i would love to have all of the above on my breakfast table now! I’m eating that gruyere bread now..
Hi Lena! Oooh gruyere bread will definitely go well as a breakfast component! Nice scramble eggs, always like eggs for breakfast but I had the stir fried one serve with fried rice or noodles! Hi Jozelyn, thank you for your compliment! Fried egg is very yummy too!